one of the most discussed surveillance pieces in 1976. Allvision was composed of two surveillance cameras, four video monitors, one central mirror sphere, and a turntable device. The mirrored sphere was placed on the turntable and centered between the two video cameras. These video cameras were connected to four separate video monitors placed around the gallery space. This setup allowed users to experience full surveillance of the central gallery space. The base frame rotated by a motor allowing the image to constantly change. It also permitted viewers to see different angles within space. The image was a bit warped and contorted, but the premises of the ideas were very bold. This invention was later used as inspiration to help record video in prisons. This idea of something that is “all seeing” can make some a bit paranoid. This instillation pushes the boundaries of what the human eye is capable of and allows blind spots to be controlled or eliminated. The idea of this piece calls to mind the artwork Twins by Richard Kriesche. The entry regarding the work can be seen HERE on Art and Electronic Media. Twins, by Richard Kriesche creates this mirror image of two twins reading the same text. These images are then broadcasted via video camera and monitor to the viewers to create their own hypothesis of what it means to them. Another parallel work that fits hand in hand with Allvision is the piece produced by Robert Adrian’s, called Surveillance (1979). The entry regarding the work, Surveillance can be seen HERE on Art and Electronic Media. Robert Adrian wears a unique white baseball hat as he passes trough the vision in Karlsplatz train station in Vienna. 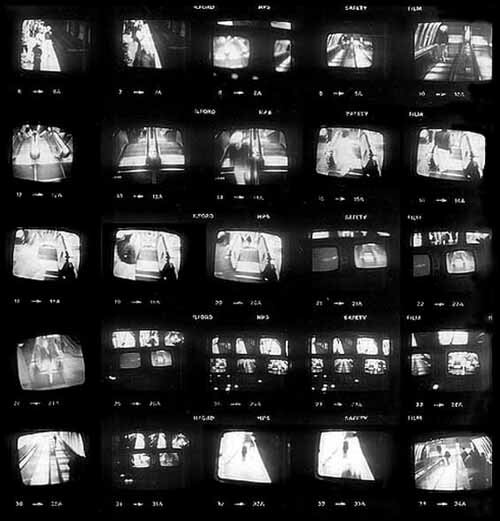 The multiple tapes of him captured, was relayed through several, stacked video monitors, and played over and over to portray this meaning of Allvision.